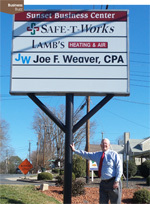 Joe F. Weaver, CPA, is an experienced Certified Public Accountant serving the Asheboro, North Carolina area. Joe is married to Connie Weaver, Pastor at Hebron Presbyterian Church, and they have 3 sons, Nathan, Henry and Thomas. Joe Weaver CPA appreciates Referrals! The practice is growing thanks to the continued support of friends, family and clients. If you have a friend or family member who can use Joe's services or would like to learn more about the services he offers, please provide the contact information below or have them contact Joe at (336) 302-3795 or by email at joe@joeweavercpa.com. $$$ - On each referral received that becomes a client, you will receive a refund of $25 on your return (once they have paid for services). That is $25 for each referral!